Jurassic HayRide What could possibly go wrong? MichiganHauntedHouses.com recently sat down with Ken Evans of Slaughterhouse Adventure & Grand River Corn Maze, to discuss what's new at Slaughterhouse Adventure & Grand River Corn Maze for the 2018 Halloween Season! 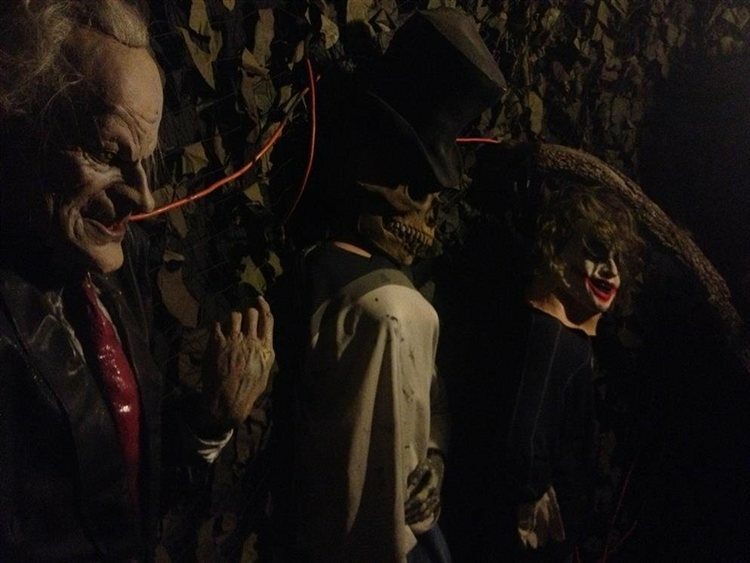 Located in Fowlerville, this haunted attraction has a ton of scares being stirred up for this year. Read below to find out what you and your friends are in for! What's new at Slaughterhouse Adventure & Grand River Corn Maze for 2018? Do you have any new rides, attractions, or special features that Haunt Seekers should know about? Every year we change things throughout all 4 venues. This year we changed 6 rooms in the haunted house. We added a couple new scares to the haunted Maze. Our biggest changes were to the Hayride. We are going with a Jurassic Park theme for the Hayride! Come see live what goes wrong when you open a park for dinosaurs! Also the last year for our JigSaw themed Escape room. Our great staff and actors coming back to execute flawlessly our unique scares in the haunted House. Also the New Jurassic Hayride is very cool! What differentiates Slaughterhouse Adventure & Grand River Corn Maze from other local haunts in Michigan? We are considerably different than most haunts because we are actor driven with unique special affects that only we perform. It takes 80 actors to staff our 3 adventures. We also have the best escape room bang for your buck without a doubt. $18 for an hour of thought provoking fun involving 3 rooms in a creepy environment......try to top that ! How long has Slaughterhouse Adventure & Grand River Corn Maze been in business? Can you tell us a bit more about Slaughterhouse Adventure & Grand River Corn Maze's history? This is our 15th season. We started out with just a few trailers in a cornfield. Over the years we’ve added a haunted hayride, a haunted corn maze, the Escape room all to go along with our 26 acre meet. What's your favorite experience since opening Slaughterhouse Adventure & Grand River Corn Maze? It’s the excitement of coming up with new ideas each year! How long is a typical haunt experience at Slaughterhouse Adventure & Grand River Corn Maze from start to finish? The haunted hayride and haunted corn maze are both 30 minutes long. Escape room is an hour long. In the haunted house runs about 16 minutes. Who knows how long it will take you to get out of the 26 acre corn maze. 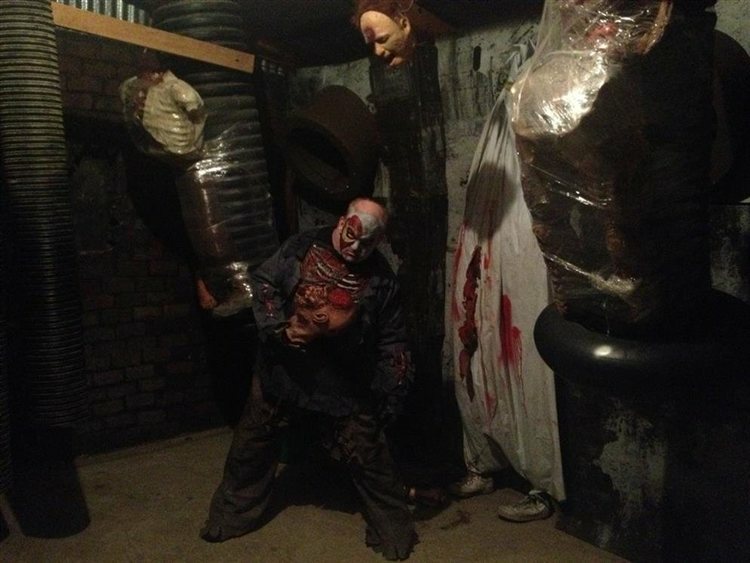 On a scale from 1 to 10, how scary would you say Slaughterhouse Adventure & Grand River Corn Maze is? Why? The scariest is the card and corn maze because you never know what’s around the corner. So that’s a 10. The haunted house isn't as scary as the maze, but has a huge wow factor about a 8. The dress UK Rhine is meant to be family friendly what does have some cool scares for the whole wagon. Scare factor is a 6. Does Slaughterhouse Adventure & Grand River Corn Maze's property have any real haunted history? Do you have a spooky encounter you'd like to share? Yes, there were dinosaur bones actually found on the property. Plus, it was a trail that led to an Indian reservation. I’ve always loved Halloween and who doesn’t ? I’m also a professional comic and in majored in theater in college. The other owner Rick loves Halloween more than I do. Plus, we’re lucky to have a staff that comes up with great ideas to produce one of a kind scares . They all take pride in it too. How has new technology (i.e. animatronics, special props, etc) helped you to enhance Slaughterhouse Adventure & Grand River Corn Maze? Lighting and sound has come a long way and we always try to keep updated with that. Over the years we tend to buy new animatronic props that we think are scary and cool. Can Slaughterhouse Adventure & Grand River Corn Maze accommodate large groups? How many people can experience Slaughterhouse Adventure & Grand River Corn Maze together as a group? Yes, we have a couple schools coming out this year with groups of 250 and 125. Does Slaughterhouse Adventure & Grand River Corn Maze offer any special deals, discounts, or coupons? Yes... contact us and we are willing to make a great deal! Anything else you'd like to let us know about Slaughterhouse Adventure & Grand River Corn Maze? We have it all... 4 top notch adventures and a 26 acre maze. We have 15 years of experience in the haunted field and we make safety a priority. We want everyone to have a great great time!